Green Haven proprietors, We would be delighted to welcome you to their 4 star bed and breakfast guest house in Stratford-upon-Avon. Ideally located within ten minutes walk of the town centre. The Royal Shakespeare Theatre, the railway station and Stratford-upon-Avon Racecourse are all just a short stroll away. 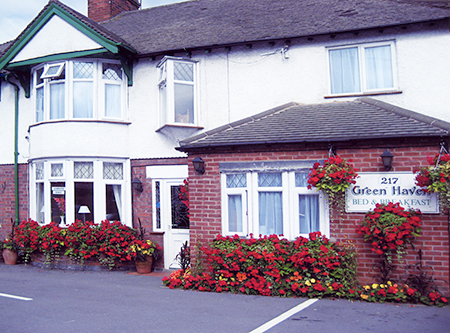 Green Haven bed and breakfast has free off-street parking for guests to use during their visit. Built in the 1930's, Green Haven has been carefully refurbished to maintain its' traditional character whilst introducing more modern facilities. The decor is fresh and simple and the ambience is warm and friendly. There are seven en-suite guest rooms, two of which are situated on the ground floor. All prices are inclusive and cover accommodation, full breakfast and car parking. Unlike some budget hotels, there are no add-ons or 'hidden extras'. We are on hand to offer help and advice when planning where to go, what to see, where to eat and so on. Green Haven makes for the perfect base for exploring Stratford-upon-Avon and the surrounding areas of Warwick, Oxford and The Cotswolds. So, if you are looking for a place to stay in Stratford-upon-Avon, choose Green Haven guest house.....you will not be disappointed! Please click here for Accessibility Options.